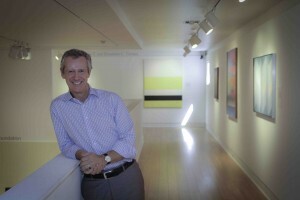 A year on the job, Executive Director Malcolm Warner appears to be reinvigorating Laguna Art Museum. A freshly painted building façade greeted the 200 people attending Laguna Art Museum’s annual open house this past week. Aside from curb appeal, it’s the sprucing up of the museum’s operations, recapped in detail during the event, that promises to bring the institution founded in 1918 up to date and in step with its sophisticated and urbanized audience. Since assuming his post in January, executive director Malcolm Warner has filled vacant personnel spots, streamlined security and visitor contacts and initiated new music, lecture and film programs that offer something for everyone during extended hours on Thursday nights. 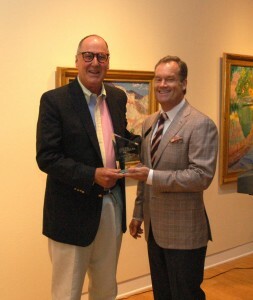 Volunteer of the Year Dennis Boyer, left, with Laguna Art Museum Chairman Robert Hayden III. As last year, the museum board took advantage of the annual meeting of members to honor a volunteer. This year’s, Dennis Boyer, an executive recruiter by trade, free of charge led the search committee to fill the museum’s top two executive posts. Boyer is also a member of the museum’s development committee and historical art council. Ed Fosmire, a former Cal State Long Beach art history professor, has been appointed as the museum’s first ever deputy director. He will oversee development and supervise staff members Jennifer Gardiner and Valery Tate. “We were understaffed and I can not remember when the museum last had a good housecleaning,” remarked museum trustee Rick C. Balzer. To attract visitors of all ages and economic strata, educational programs will be expanded by a new curator of education, Marinta Skupin. Free since February, student memberships in the museum have grown to 259 from 15. Museum staff will also mentor young artists from the Boys and Girls Club and Laguna Beach High School while also initiating outreach specific to seniors. On Nov. 13, the museum will conduct its first Educator’s Open Door, designed to introduce teachers to the museum’s education programs, exhibitions and offer free classroom materials. General admission has been lowered to $7, more free Family Days are planned and the museum store will become fully operational again. While general attendance has held steady for the past two years, the First Thursday presentation Conversations with the Artists, upped evening museum attendance by 43 percent since its inception last December. Second Thursday music programs have drawn 100-person audiences in a space that seats 80, said spokeswoman Marni Farmer. “I am very proud of getting the Thursday evening programs going; the atmosphere is magical with people listening to beautiful music in a beautiful setting,” said Warner. In keeping with the museum’s renewed commitment to California art, Warner looks forward to curating a show spotlighting selections from the permanent collection. “It has been a long time since we filled the main level with our own holdings and, getting to know the collection, I am certain that people will be surprised by the quality,” he said. Curator of contemporary art Grace Kook-Anderson will continue to develop the ex.pose program slated to feature contemporary works by Macha Suzuki and Allison Schulnik. Janet Blake has been re-branded as curator of early California art, a move that allows her to concentrate on her areas of expertise. Former membership manager Dawn Minegar takes over Blake’s former duty as registrar, keeping track of works in the permanent collection, pieces on loan from other institutions and collectors and overseeing intricacies of travel and insurance on the collection. This year, the permanent collection boast new paintings by Richard Bunkall, Larry Cohen and Feodor Voronov, a George Herms assemblage, five drawings and 14 lithographs from the Beth Van Hoesen estate, a serigraph by Sister Corita Kent and a glass and neon work by Laddie John Dill. Much of the museum’s community outreach, such as the broader plein-air paint-out, was stipulated in the terms of a $375,000 James Irvine Foundation grant in 2009. In the fiscal year ending June 30, gifts and grants of $524,000 (including another Irvine Foundation grant of $143,000) comprised 33 percent of museum revenues. Special events netted $265,000, 17 percent of museum revenue. Total expenses amounted to $1.6 million. The museum’s endowment declined to $1.1 million compared with last year’s $1.35 million, business manager Peter Solomon reported. Members of the museum’s board were also introduced as well as election results. Thomas B. Stiles, II begins his term in as the new vice chairman and treasurer and Jane Hanauer as the new secretary. Former secretary Sara Heeschen completed her term but will remain a trustee. In an interview prior to the meeting, Warner summed up his short tenure. “I am getting great satisfaction from working with my new colleagues, the changes we are making and the warm welcome I have received from the community.